Keep It 1.5 is now available. This version adds support for Dark Mode on macOS Mojave, Siri support, highlighted search results, the ability to see unfiled items, and the Mac app is now scriptable. Searching on iPad and iPhone has been improved with suggestions, the ability to combine terms, save the current search, and to find text and step through each occurrence in a variety of file types. Both Mac and iOS apps also benefit from improvements to the item list, Markdown editing and previews, PDFs, and plenty more besides. Keep It for Mac will support Dark Mode and accent colors on macOS Mojave, which is due out next Monday. For Dark Mode, the content of notes, plain text files, and Markdown files using built-in preview and editor styles will automatically switch to a dark appearance, and there are options to override that, and always use a light appearance for notes and Markdown files. On iPad and iPhone, Siri can now create notes in Keep It, append text to notes, and search for items. Keep It makes viewed items available for shortcut predictions in iOS 12. When searching on iPad and iPhone, Keep It will now show suggestions above the keyboard, and can tokenize terms in the search field, allowing complex searches to be created. Tapping a suggestion will add it to the search field, tapping and holding on a suggestion will show alternative ways to match results. It’s now possible to save the current search on iOS. 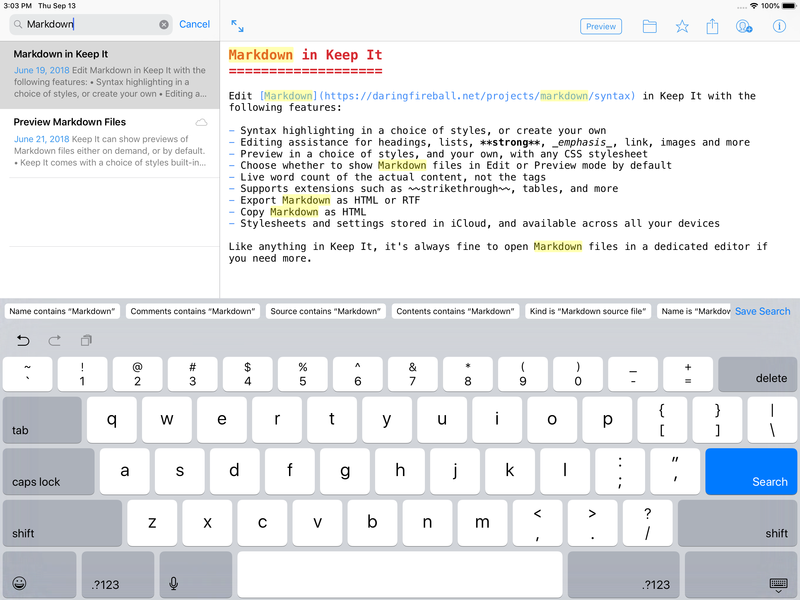 When searching, Keep It can now highlight the found text in the content of notes, rich and plain text files, Markdown files, PDFs and web pages on both Mac and iOS. On iOS it’s now possible to find and step through each occurrence of a particular word or phrase in notes, Markdown files, rich and plain text documents, PDFs and web pages. On Mac, which could already do that for most file types, it’s now possible to step through occurrences of text in web pages, and finding text in PDFs has been improved to highlight all occurrences at once, and show the number of results. There is now an optional “Unfiled” list that shows items which haven’t been filed into a folder or bundle, along with a “No Label” list to show unlabelled items. It’s now possible to see and work with favorite lists on iOS by tapping the icon above the Lists view. Tapping a favorite list will show that list, and favorite lists can be rearranged and removed here too. The item list has been redesigned to provide greater flexibility and make better use of space. It’s now possible to show no preview lines in the item list; the date is now on the same line as the summary, and can be hidden if not required. It’s now also possible to always show the item’s Kind at the start of the summary, and on Mac tooltips will be shown when hovering the mouse over a name that is too long to be shown in its entirety. On macOS Mojave, the date will be shown in the system accent color. You can now paste and drag (on Mac and iPad) links into Markdown files, and drag Keep It items to create links to those items. Markdown previews will now include syntax coloring for fenced code blocks where the language is indicated. Keep It for Mac is now scriptable, so it’s possible to manipulate pretty much everything in the library, add files and web links, create notes from text, attach files, get highlighted sections, and export. You can now see when a PDF highlight has an associated note. On Mac, it’s now possible to use bookmarklets that override the defaults to save links in specified formats, and there are new keyboard shortcuts and improvements for organizing items on iOS. See the release notes for Mac and for iOS for a full list of changes. Keep It 1.5 is a free update for all existing customers. Keep It for Mac is available for $49.99 directly from Reinvented Software, and Together 3 users can upgrade for $24.99, unless they purchased Together 3 in its final 6 months on sale, in which case the upgrade is free. A 15-day free trial can be downloaded from this site. 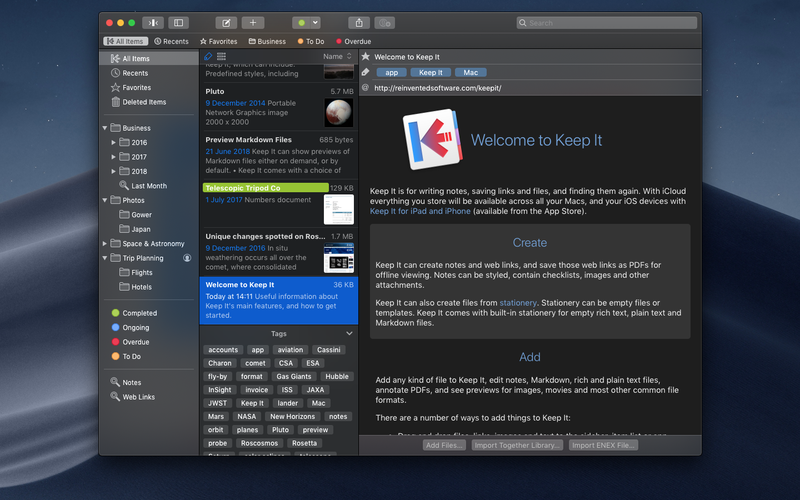 Keep It for Mac is also available from the Mac App Store, offers a free trial and a choice of one-time purchase for all Keep It 1.x releases for $49.99, or an upgrade from Together 3 for $24.99 (or free if Together 3 was purchased in its final 6 months on sale). Alternatively, choose from yearly or monthly subscriptions at $19.99/year or $2.49/month. Keep It for iPad and iPhone is available separately from the App Store with a choice of yearly or monthly subscriptions at $9.99/year or $1.49/month. This entry was posted on Monday, September 17th, 2018 at 4:14 pm by Steve Harris	and is filed under Keep It. You can follow any responses to this entry through the RSS 2.0 feed. Both comments and pings are currently closed.